I only managed to get this crappy photo before I decided that suspiciously hanging around the Dusk Till Dawn car park with a camera – which had already alerted three bored bouncers to my activity, when I’m sure I’d specifically told it not not to flash – was probably a bad idea. 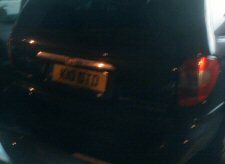 In case you can’t actually see anything, it’s a Chrystler MPV, registration: K10 DTD. So whose car is this? Simon "king-ten" Trumper doesn’t quite have the right ring to it, does it?